Perler beads are a kid’s craft staple. If you have a few thousand or so lying around your house, try one of these creative crafts with the kids. Choose 4 different colors of Perler beads. Arrange them in a V pattern on the pegboard. Heat up your iron. Put a piece of Perler bead ironing paper over the beads, then iron over the beads until they melt enough to fuse together. Cut 2 long pieces of string. Slide the strings through the 2 top beads on either side of the necklace. Fold the string in half and tie a knot in both strings as close to the beads as possible. 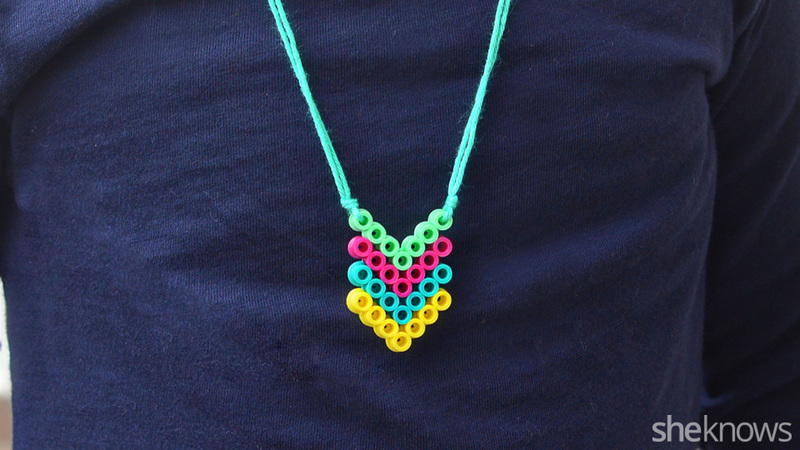 Tie both loose ends of the string together to make the necklace. Fill the entire square pegboard with Perler beads. Lay the ironing paper on top of the beads and use the iron to melt the beads together. Remove the square from the pegboard. 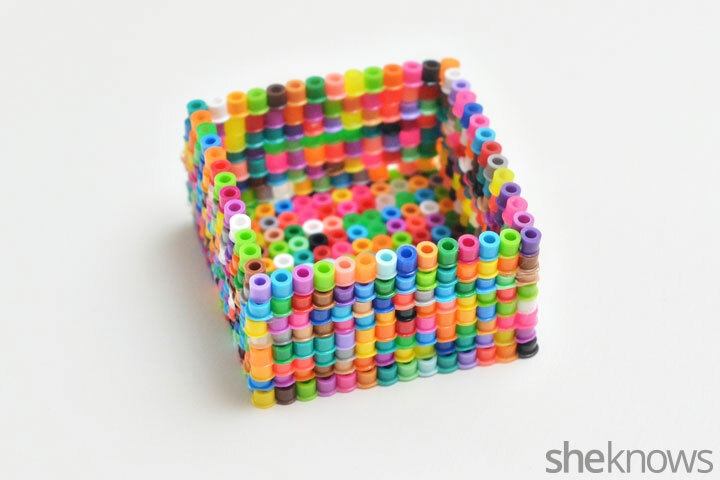 Fill just the perimeter of the pegboard with Perler beads to make a square with an open center. Melt the beads together with a hot iron. Repeat step 3 until you have 7 open squares. Use glue to glue the open squares on top of each other, then glue them on top of the solid square to create a box. Set the beads on end inside the oven-safe dish. Place the beads in the oven and bake them at 300 degrees F for 15 to 20 minutes. Watch the beads closely; you want them to melt slightly so they are nice and round, but not melt so much that they turn into a blob. Remove the beds from the oven and allow them to cool. Cut a piece of string approximately 1 foot in length. Tie a knot near the middle of the string and feed the beads on the string. Tie a second knot at the end of the line of beads. 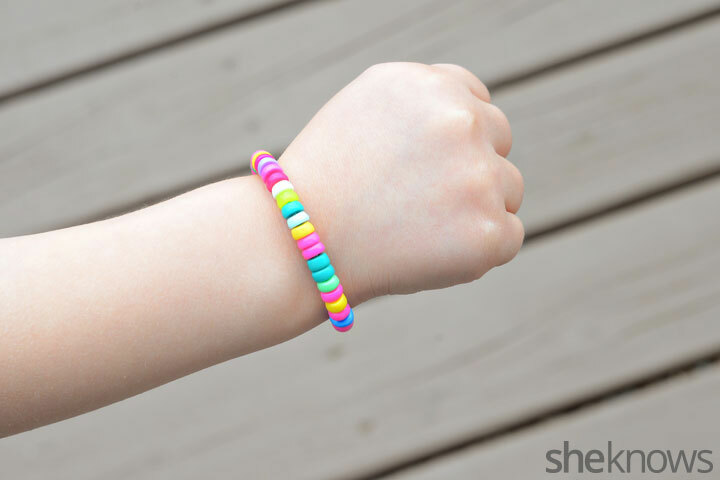 Wrap the bracelet around your child’s wrist and tie both loose ends into a knot to keep it on. 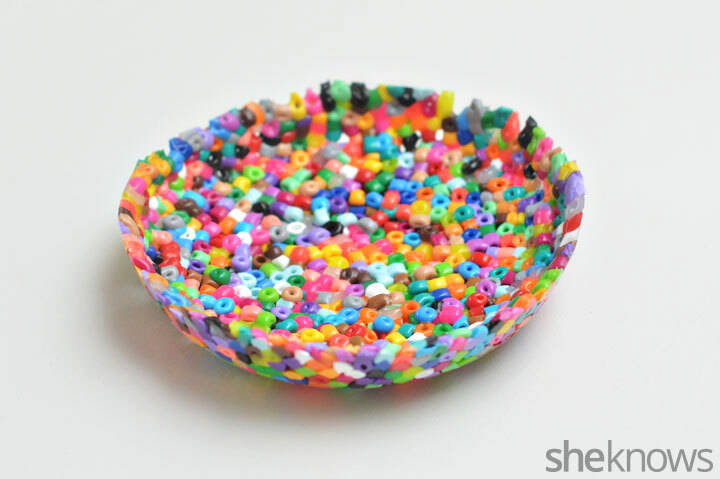 Pour a few fistfuls of Perler beads into an oven-safe bowl. Spread the beads evenly around the bowl, including up along the sides of the bowl as far as you can. Place the bowl of beads in the oven and bake them for 20 to 30 minutes. Watch the bowl closely to make sure the beads don’t melt too much. Remove the bowl from the oven and allow it to cool. Once it is cool enough to handle, you can remove the beads from the bowl.